Finally got a chance to do a little experiment that I had been wondering about. I wanted to see best "theoretical" floatation that could be achieved with one of my tires. The snow conditions were about 3 feet of fresh powder. The snow had not compacted at all, making conditions prime for this experiment. 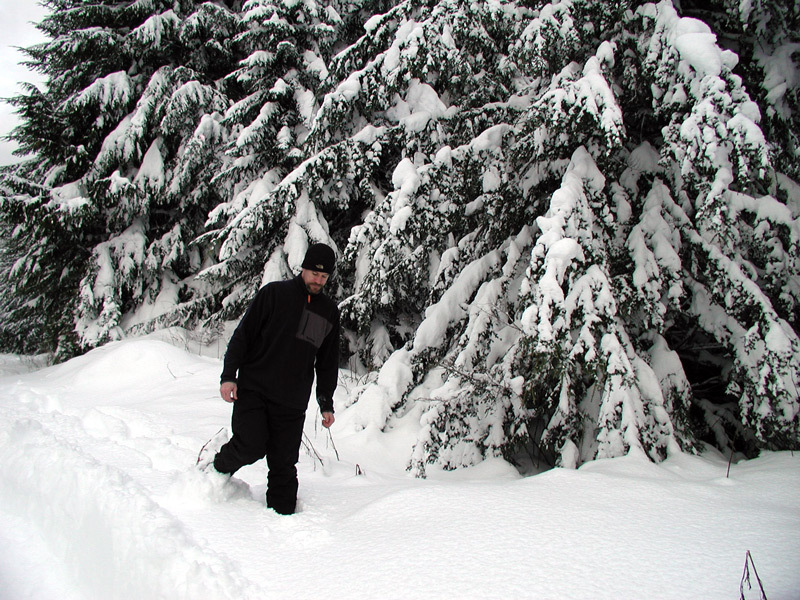 I went for a quick walk in my snowshoes. 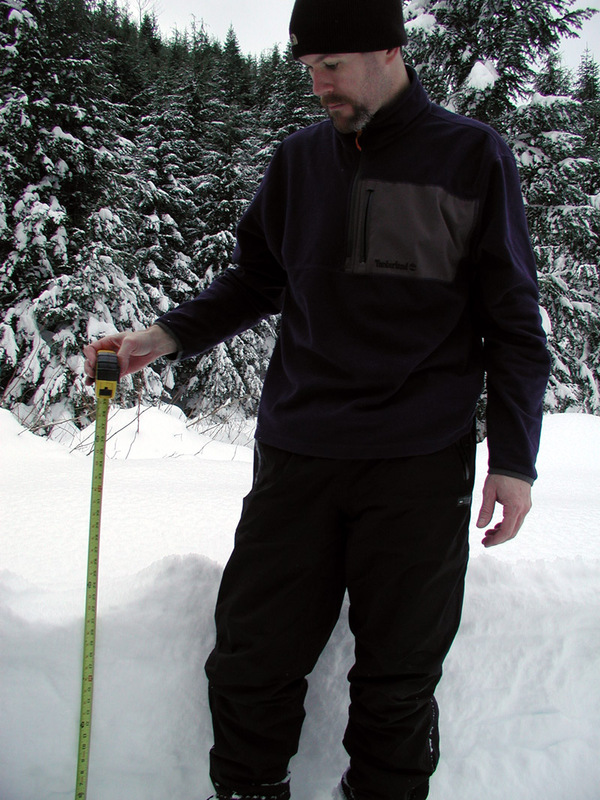 I didn't measure, but I was sinking nearly a foot while wearing snowshoes! My bronco tires were aired down to 2psi. I pulled off to the side of the road in some fresh snow. Tried to maintain as much floatation as possible. I was sinking about 21-22 inches. 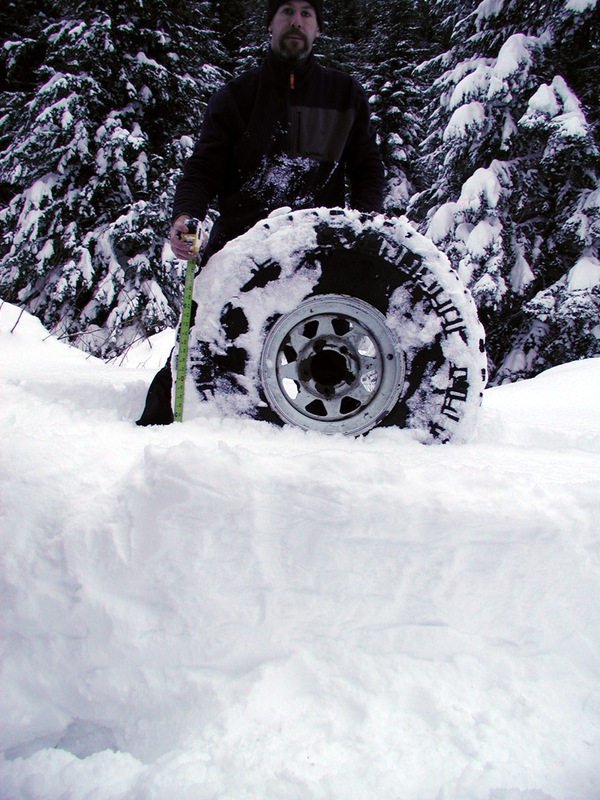 Then I broke out my 36x12.50R15 spare tire and rolled it from my existing tracks onto the fresh snow. The tire climbed right up. It was sinking about 11 inches. 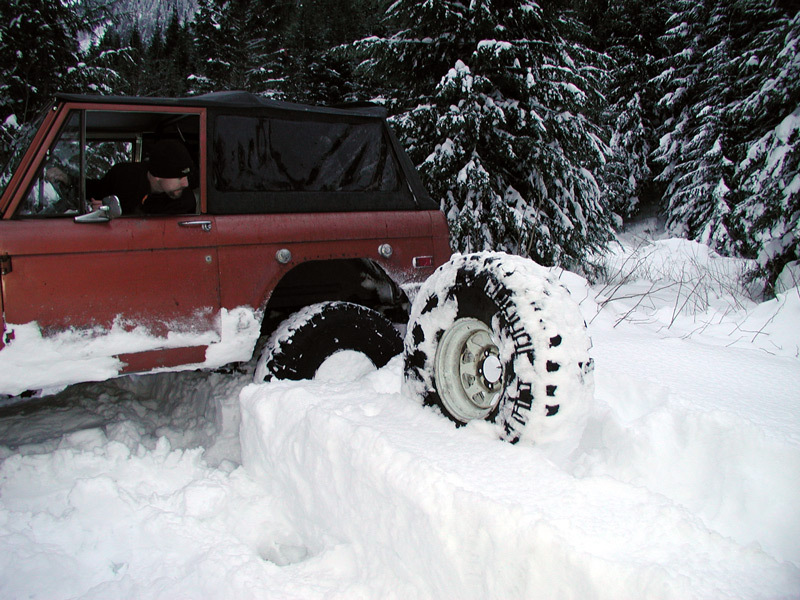 I did notice that as the snow packed lugs rolled around the tire seemed to float even more. I put my 190+ lbs on it and it didn't seem to sink any more. Since my bronco is pretty nose heavy, I backed in my bronco into the fresh snow by the spare tire. I was in a hurry since it was getting late, so I didn't take a measurement. It appears that my back tire did come up a bit. So what can we extrapolate from this experiment? Well, I was trying to demonstrate why taller tires are better. I'm not sure I acheived that with this test...maybe I just need to pack a lighter lunch. However, had I been running 40's or 44's, I would have been pushing much less snow. And, a vehicle running 31's would be dragging diffs even if it weighed zero lbs. Hopefully one of these trips we can get some floatation comparisons between wide and narrow tires. what size tire are you running?? Interesting. n16ht5 wrote: what size tire are you running?? Interesting. My tires are 36x12.50R15 super swamper TSL radials. The tread width is only 9.5 inches which is pretty narrow. I too grew from 31's to 34's to 36's. 36 inch was definitely the magic number to be able to get out and break trail. I thought so, couldn't remember. how much does your truck weigh all gassed up? I think it's in the 4,200 - 4,300lbs range. Pretty nose heavy though. I think my V8 Bronco II was much better balanced. We can do a weight comparison next time out as I now have the same 36x12.5 tsl radials on the Samurai now. I have yet to weigh it yet but I'm hoping less than 3,000 lbs with the Toyota axles. Sounds like a plan. I look forward to seeing the results.